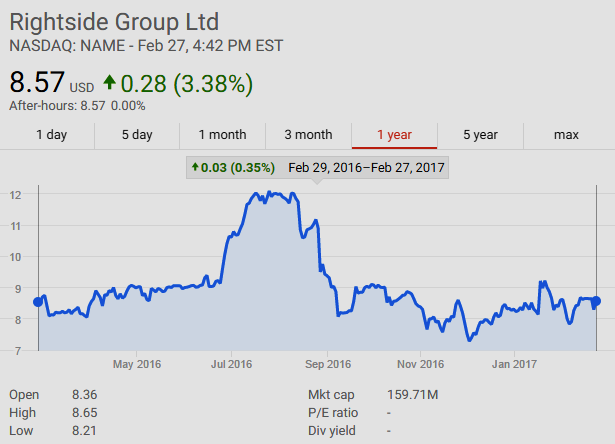 Rightside Group, Ltd. [NASDAQ: NAME | domain: rightside.co] domain name registry and registrar services provider, Q4 2016 financial results release after market close on February 28, 2017. Q4 2016 results: Q4 EPS of -$1.35 but SeekingAlpha.com reports that may not be comparable to consensus of -$0.41. Revenue of $14.9M beat consensus estimate by $0.84M. Net Loss $21.3 million. Business Outlook for the full year ending December 31, 2017, Rightside expects the following: Total revenue of $58 to $62 million inclusive of 10 to 15% growth in our core registry and registrar business. Cash bookings in our registry business of around $16 to $18 million. Adjusted EBITDA of around break-even for the full year with a return to positive adjusted EBITDA in the fourth quarter after implementing cost savings initiatives and restructuring our network infrastructure to support the remaining business lines. Rightside Registry--new gTLDs and "backend" registry services--see Rightside 40 new gTLDs | ntldstats.com. Of Rightside's 40 new gTLDs, .LIVE and .NEWS have the most domain name registrations, but .LIVE and .NEWS registrations are less than 100,000 each and four of Rightside's new gTLDs have not even achieved 1000 domain name registrations (as of Feb 26, 2017). The overall weak registration numbers have given Rightside a total "new gTLDs market share" of only slightly more than 2% among all new gTLD registry operators. The Internet Corporation for Assigned Names and Numbers, known as ICANN, mismanaged the global DNS and damaged the competitive global market for domain names by grossly over-expanding the number of new generic top-level domains (new gTLDs), beginning in 2014. As a result, many new gTLD registry operators are financially struggling, and after more than three years, many are still unprofitable. Note: Schedule 13D dated Feb 14, 2017, filed by J. Carlo Cannell, Cannell Capital LLC [representing 1,704,805 $NAME Shares / 8.78%] excerpt (emphasis added)--"Mr. Cannell, on behalf of the Investment Vehicles, identified the Company as an entity satisfying each of the Investment Vehicle's investment criteria. The Investment Vehicles acquired and continue to hold the Shares as a long-term investment. Cannell Capital files this Schedule 13D amendment in order to announce the formation of the SAVE NAME GROUP (“SNG”) on February 14, 2017. This announcement is attached as Exhibit 99 [embedded below]. Mr. Cannell reserves the right to discuss various views and opinions with respect to the Company and its business plans with the Company or the members of its senior management. The discussion of such views and opinions may extend from ordinary day-to-day business operations to matters such as nominees for representation on the Company’s board of directors, senior management decisions and extraordinary business transactions. Mr. Cannell reserves the right to take such action as he may deem necessary from time to time to seek to maximize the value of the Shares. Such actions may include, but may not necessarily be limited to, pursuit of strategic initiatives to enhance shareholder value ..."
The GSMA’s 2017 Report Embracing the Digital Revolution, Policies for Building the Digital Economy (pdf) examines the impact of digital technologies globally and calls on government to use progressive policies to drive their countries, societies and economies ahead. Features • 1. ICANN Multistakeholder vs Multilateral Internet Governance; 2. Why ICANN Multistakeholderism Is Failing; 3. Private Agreements and Antitrust Liability; 4. How ICANN threatens DNS Security & Stability; 5. Phishers shifting to ICANN's new gTLDs; 6. Bogus DMCA Take Down Notices; 7. TMCH Revised Report; 8. Internet Freedom Report: Malta, Cameroon, China; 9. A 'Digital Geneva Convention'; 10. Trump's Trademark in China; 11. Outlook email for your domain name; 12. SHA1 collision; 13. Hacked ICANN data still sells; 14. ICANN events May 9-15 in Madrid; 15. ICANN Public Comment Periods closing in March; 16. Most popular posts this past week. "I think if we get rid of that [IANA functions] contract we will be free of the pressures"--ICANN President and CEO Fadi Chehade, February 10, 2015. February 2017: "... The reformed [ICANN] multistakeholder internet governance approach faces significant challenges ... If the multistakeholder model is seen as ineffective in addressing the vulnerabilities that enable cybercrime, or being completely peripheral to the issue, developing economies could question its legitimacy and seek answers in the multilateral system .... "There are also worries that ICANN, the operator of the IANA functions, will abuse its authority and ignore the interests of internet users. In the past, ICANN has been accused of ignoring the views of governments, prioritizing private sector interests, and mismanaging its finances. ICANN recently implemented enhancements to address these and similar concerns. Nevertheless, ensuring that ICANN remains accountable will be critical to demonstrating that the multistakeholder approach works. It will also act as a bulwark against Russian and Chinese efforts at greater intergovernmental control over the internet." --Maintaining U.S. Leadership on Internet Governance | Council on Foreign Relations | cfr.org (emphasis added). UPDATE: Shadow Regulation Withers In The Sunlight | Electronic Frontier Foundation | eff.org: "... It’s not surprising that a plan developed in secret, without input from Internet users, would disregard users’ rights. As we’ve explained, truly “healthy” Internet governance requires inclusion, balance, and accountability, all of which were absent here. Public Interest Registry did the right thing by hitting the brakes on this proposal. Its brief announcement today acknowledges the importance of good policy-development processes ..."
"... for the Hyderabad meeting, a single sponsor group proposed a HIT (High Interest Topic) session on DNS and Content Regulation. Initially, the sponsoring group was allowed to select panelists and designate the moderator, who was also part of the sponsoring organization. Through persistence by other stakeholders, panel participation was broadened considerably. Still, during the HIT session, the sponsoring organization opened with a presentation of their position. In our view, this did not meet the level of broad participation of the ICANN community to warrant a high-interest session ..."
At the NCPH Intersessional, [ICANN] Compliance Concerns Take Centre Stage | circleid.com Feb 23, 2017: ".... as things stand at present, if a domain name can be repossessed from a registrant for any reason at all, without any due process being followed, and in direct violation of Article 1 of the organisation's bylaws, it might well be ICANN that is posing a threat to the security and stability of the Domain Name System" (emphasis added). See also ICANN Compliance Lends a Hand to a Violent Criminal While Trashing a Legitimate Business | circleid.com. Editor's note: never forget that among the real core values of ICANN, as established during the Fadi Chehade-Akram Atallah regime (2012-2016), are dishonesty, incompetence, and cronyism. 5. New study reveals phishers are shifting their sights to ICANN's new gTLDs and the cloud: "A study by cybersecurity firm PhishLabs indicates that the volume of phishing attacks grew by almost one-third last year, with cloud storage brands set to overtake financial services as the top targets. Researchers also found that phishing perpetrators are increasingly turning to new gTLDs to dupe internet users." --WorldTrademarkReview.com (emphasis and link added). 6. Bogus DMCA Take Down Notices: in a comment to the U.S. Copyright Office (pdf), Google reports that 99.95% of URLs it was asked to take down last month didn't even exist in its search indexes. "For example, in January 2017, the most prolific submitter submitted notices that Google honored for 16,457,433 URLs. But on further inspection, 16,450,129 (99.97%) of those URLs were not in our search index in the first place." Cameroon must urgently free the internet in Anglophone regions - UN expert | AfricaNews.com: "Cameroon should immediately reverse the ‘‘appalling violation of their (citizen’s) right to freedom of expression,” in its Anglophone regions by restoring internet access, a United Nations expert has said." China Ramps Up Control of Domain Names, Adds New Layer to Great Firewall | rfa.org: "The draft regulations, which were first released for public consultation in March 2016, would require any websites operating in China to register with a Chinese domain name, which is subject to state control and can be used to shut down entire websites within the country-level .cn top-level domain." Also note: Internet Freedom Festival | 6 – 10 March 2017: The Global Unconference of the Internet Freedom Communities, March 6-10, 2017, Valencia, Spain. 9. A 'Digital Geneva Convention': "... Just as the Fourth Geneva Convention has long protected civilians in times of war, we now need a Digital Geneva Convention that will commit governments to protecting civilians from nation-state attacks in times of peace. And just as the Fourth Geneva Convention recognized that the protection of civilians required the active involvement of the Red Cross, protection against nation-state cyberattacks requires the active assistance of technology companies. The tech sector plays a unique role as the internet’s first responders, and we therefore should commit ourselves to collective action that will make the internet a safer place, affirming a role as a neutral Digital Switzerland that assists customers everywhere and retains the world’s trust ..."--Brad Smith, Microsoft President and Chief Legal Officer, blogs.microsoft.com. See also Bruce Schneier: It's time for internet-of-things regulation | searchsecurity.techtarget.com. 10. Names, Domains, Trademarks: President Trump wins trademark rights for his name in China | worldipreview.com. Hands-On with Outlook.com Premium | Thurrott.com: "if you sign up now, “your subscriptions will auto-renew annually at $19.95 (Outlook.com Premium) .... This is an affordable option*, and it’s a nice way for a family to get a custom domain and not be stuck with an outlook.com or hotmail.com address." More info: https://premium.outlook.com/#/Offer "you can create personalized addresses for up to 5 people and sync everything to your existing Outlook.com mailbox." 12. Announcing the first SHA1 collision | security.googleblog.com: "For the tech community, our findings emphasize the necessity of sunsetting SHA-1 usage. Google has advocated the deprecation of SHA-1 for many years, particularly when it comes to signing TLS certificates." 13. Hacked ICANN data still sells for hundreds of dollars years after breach | cyberscoop.com: "Three years after hackers used a spearphishing attack to successfully gain access to internal data at the Internet Corporation for Assigned Names and Numbers (ICANN), the data is still being passed around and sold on black markets for $300, complete with claims that it’s never been leaked before." 14. ICANN events May 9-15 in Madrid: 1) ICANN GDD Industry Summit May 9-11, 2017; 2) 6th Registration Operations Workshop May 12, 2017; 3) ICANN DNS Symposium May 13, 2017; 4) OARC 26 May 14-15, 2017. Read more at InternetSociety.org. Monday, Feb 27: T-Mobile US, 10:30 AM PT; GoDaddy**, 2:10 PM PT; Alphabet Inc.*, 3:00 PM PT; Intel, 4:35 PM PT. Tuesday, Feb 28: Facebook, Sheryl Sandberg, COO & Dave Wehner, CFO, 12:00 PM PT; Crown Castle, 5:10 PM PT. *Ruth Porat, Senior VP and CFO, Alphabet Inc., will participate in the Morgan Stanley Technology, Media and Telecom Conference in San Francisco, in a session scheduled for 3 pm PT / 6 pm ET on Monday, February 27, 2017. LIVE audio webcast of the session here. "The problem with apps, Krug argued, is that they come with a lot of friction. Apps have to be advertised heavily because it’s hard to find them amid millions of other apps in the stores. Then they have to be downloaded and installed. Then the user has to open the app and play. Each one of those points its a source of friction, where some of the potential users will drop off." See also: How HTML5 instant games could disrupt the app stores in 2017 | VentureBeat.com. 3. How to Win a Trade War With China | Bloomberg.com: "... use reciprocity as a guideline—in other words, match Beijing’s restrictive policies with similar measures on Chinese activities in the U.S. ... The bottom line is that the U.S. has to see its economy the way China envisions its own. China is unlike any other country participating in the U.S.-led global economy: It intends to benefit from the openness and security offered by that system without being obligated to abide by its norms." 4. Google Agrees to YouTube Metrics Audit to Ease Advertisers’ Concerns | WSJ.com: Google will let the Media Rating Council audit YouTube ad data, as well as ads displayed on non-Google sites purchased via AdWords, DoubleClick Bid Manager. 5. The LaCroix Sparkling Water Label's Secret History | BonAppetit.com: "Douglas Riccardi, owner and creative director at Memo NY, a graphic design studio specializing in restaurant branding, is both fascinated and dumbfounded by LaCroix’s success. “It goes against everything I stand for as a branding expert and designer,” says Riccardi, who counts Mario Batali’s restaurants among his clients. “The logotype is not especially well-crafted. The pattern on the cans looks like the love child of Monet and Grandma Moses.”"
6. This Company Has Built a Profile on Every American Adult | Bloomberg.com: "The most important tools for America’s 35,000 private investigators are database subscription services ... IDI [ididata.com], a year-old company in the so-called data-fusion business, is the first to centralize and weaponize all that information for its customers. The Boca Raton, Fla., company’s database service, idiCORE, combines public records with purchasing, demographic, and behavioral data. Chief Executive Officer Derek Dubner says the system isn’t waiting for requests from clients—it’s already built a profile on every American adult, including young people who wouldn’t be swept up in conventional databases, which only index transactions. “We have data on that 21-year-old who’s living at home with mom and dad,” he says." 7. Why Amazon Is The World's Most Innovative Company Of 2017 | FastCompany.com: "... The website that once sold only books now lets anyone set up a storefront and sell just about anything. The warehouse and logistics capabilities that Amazon built to sort, pack, and ship those books are available, for a price, to any seller. Amazon Web Services, which grew out of the company’s own e-commerce infrastructure needs, has become a $13 billion business that not only powers the likes of Airbnb and Netflix, but stores your Kindle e-book library and makes it possible for Alexa to tell you whether or not you’ll need an umbrella today ..."
8. Google's Adoption of RCS Will Save Messaging on Android | WIRED.com: "Google has been working with hundreds of carriers and manufacturers around the world to bring the text message into the 21st century. Using a standard called Rich Communications Services [RCS], the group plans to make a texting app that comes with your phone and is every bit as powerful as those dedicated messaging apps. This would make all the best features available to everyone with an Android phone." 9. AWS Taking On Microsoft, Google with Productivity Suite | TheInformation.com: Amazon's AWS working on upgrades to its WorkMail email-calendar app and its WorkDocs file storage-collaboration app to "make them more attractive to corporate customers." Verizon and Yahoo amend terms of definitive agreement | verizon.com: Verizon and Yahoo reduce price of acquisition deal by $350M, now valued at about $4.48B, and will evenly split cost of data breaches. Zuckerberg & Facebook: Manifestos and Monopolies | Stratechery.com by Ben Thompson: "the last thing we need are unaccountable leaders who put their personal interests above those they purport to govern." One more thing: There's a Difference: Fake News and Junk News: "It's slowly dawning on the media-consuming public that the MSM is the primary purveyor of "fake news"-- self-referential narratives that support a blatantly slanted agenda with unsupported accusations and suitably anonymous sources."--charleshughsmith.blogspot.com. 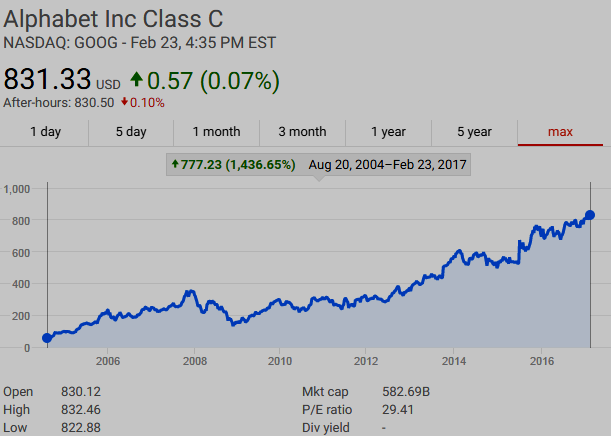 $GOOG shares have increased in value 1436.65%, Aug 20, 2004 - Feb 23, 2016 (see above). The first funding for Google (principal domain: google.com) was in August 1998, $100,000 from Andy Bechtolsheim, co-founder of Sun Microsystems, before Google was even incorporated. 3 other angel investors also invested in 1998: Amazon.com founder Jeff Bezos, Stanford University computer science professor David Cheriton, and entrepreneur Ram Shriram. Early in 1999, founders Sergey Brin and Larry Page decided they wanted to sell Google to Excite (excite.com). They went to Excite CEO George Bell and offered to sell it to him for $1 million but he rejected the offer. Vinod Khosla, one of Excite's venture capitalists, talked Page and Brin down to $750,000, but Bell still rejected it. A $25 million round of funding was announced on June 7, 1999, major investors included venture capital firms Kleiner Perkins Caufield & Byers and Sequoia Capital. Google's initial public offering (IPO) was August 19, 2004, at which time Larry Page, Sergey Brin, and Eric Schmidt agreed to work together at Google for 20 years, until the year 2024. At the IPO, the company offered 19,605,052 shares at a price of $85 per share. The sale of $1.67 billion in IPO shares gave Google a total market capitalization of more than $23 billion. Today Google (through its holding company, Alphabet Inc.) is approaching a total market cap of $600 billion. Video above published Oct 11, 2016: Open Whisper Systems is also the force behind the Signal Protocol that powers the encryption built into #WhatsApp, #Facebook #Messenger, and #Google Allo's Incognito mode. Signal’s new anti-censorship feature uses a trick called “domain fronting,” a versatile censorship circumvention technique that hides the remote endpoint of a communication. Domain fronting works at the application layer, using HTTPS, to communicate with a forbidden host while appearing to communicate with some other host, permitted by the censor. See also Open Whisper Systems | GitHub.com. Splunk President and CEO Douglas Merritt discusses revenues, cloud sales and the company’s focus on cybersecurity, with Caroline Hyde on “Bloomberg Technology,” February 9, 2017. 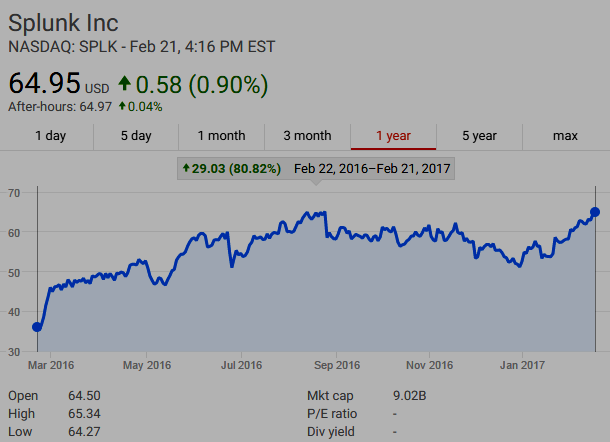 Splunk Inc. (NASDAQ: SPLK) is a U.S.-based multinational corporation headquartered in San Francisco, California, that produces software for searching, monitoring, and analyzing machine-generated big data, via a web-style interface. In 2015, Splunk acquired Caspida, a cybersecurity startup, for $190 million, and also "sealed a cybersecurity alliance" with U.S. government security contractor Booz Allen Hamilton Inc. to offer combined cyberthreat detection and intelligence-analysis technology. In 2016, Google announced that its Google Cloud platform will integrate with Splunk to expand in areas like IT ops, security and compliance. Splunk®, Splunk>®, Listen to Your Data®, The Engine for Machine Data®, Hunk®, Splunk Cloud™, Splunk Light™, SPL™ and Splunk MINT™ are trademarks and registered trademarks of Splunk Inc. in the United States and other countries. Airbnb Open is a community-powered festival of travel and hospitality that celebrates a city and its neighborhoods. Fortune.com's Leigh Gallagher explains the three business lessons you can learn from Airbnb. Video above published Dec 22, 2016. Oaktree Capital's Howard Marks on Cycles, Panics & Valuation (podcast audio here): Barry Ritholtz interviews Howard Marks of OaktreeCapital.com, for Bloomberg's Masters in Business (MIB) podcast series. Ritholtz last interviewed Marks in July 2015 for MIB (interview here). Marks and his partners formed Oaktree Capital in 1995 with a focus on high-yield bonds, distressed debt, private equity, and other credit based strategies. Oaktree currently manages 22 separate debt funds, totaling over $100 billion dollars in assets under management. Oaktree's 17 distressed funds' returns have averaged over 19% per year (after fees) over the past 22 years. Ritholtz has noted that "Marks had the foresight to set up an 11 billion dollar distressed fund (7B) raising capital from March 2007-08. By June 2008 they had called 12% of it; following the collapse of Lehman Brothers on September 15th 2008, they began putting half a billion dollars per week to work in the credit marks. They finished the year about 70% invested, deploying 6.5 billion dollars by years end." Marks may be best known for his Chairman’s Memos that he has been writing since 1990, noting that he spent the first decade printing them, inserting them into envelopes and physically mailing them off into the world, with zero response. Finally, with his January 2000 letter “Bubble.com,” there appeared to be evidence that people were actually reading them. At Warren Buffett’s urging, Marks wrote the book The Most Important Thing. Domain Mondo Editor's Note: last MacroView post (Feb 16, 2017) at least for awhile. Features • 1. China Cyber Sovereignty vs ICANN Multistakeholderism; 2. ICANN Websites, More ICANN Incompetence; 3. Average Annual Cost of an ICANN Employee; 4. Class Action vs Neustar; 5. Google.com UDRP; 6. GoDaddy Q4 2016 Results; 7. InternetAssociation.org political fundraising; 8. Names, Domains, Trademarks; 9. The Internet's 'Seven Keys'; 10. DOA not a replacement DNS; 11. ICANN CEP & IRP update; 12. Internet Attack Mitigation; 13. ICANN mafia; 14. Verisign 10-K (.WEB); 15. One of ICANN's stupid ideas gets nixed; 16. 3 most popular posts this past week on Domain Mondo. Q: One central criticism of the multistakeholder model is that it isn’t representative enough ..." How do you respond? "There is no question there are inequities in participation ..."
Q: Do you think that China’s concept of cyber sovereignty is incompatible with the multistakeholder model? What are the implications? "... For China, which isn’t a fan of private actor input in almost any decision making, the ICANN model is a problem." *Kal Raustiala is a Professor of Law at UCLA, and Director of the UCLA Ronald W. Burkle Center for International Relations. Question: "... So the easy one that surprisingly came up first and everybody but a few people asked, it’s been coming up today as well many times, why can nobody ever find anything on ICANN websites other than by Googling sometimes but no search function, there is no organization. It’s impossible to find anything. Why don’t you hire a librarian to sort it out? ICANN President & CEO Göran Marby: "That’s a very good question. Actually it is a very good question ... The simple answer to that question is that you are right. We don’t have a library function. We don’t have a document management system at all and, even worse than that, we don’t have any system in place on how to store things, how to label things, how to categorize things, how to collect things, and how to sort them together ..."
4. A class action suit has been filed against registry services and technology provider Neustar, Inc. ("Neustar"), [NYSE: NSR | domain: Neustar.biz]--MarketWatch.com--Rigrodsky & Long, P.A. announced it had filed a class action complaint in the United States District Court for the District of Delaware on behalf of shareholders of Neustar in connection with the proposed acquisition of Neustar by Golden Gate Capital and its affiliates (collectively, "Golden Gate") announced on December 14, 2016. The Complaint alleges violations of the Securities Exchange Act of 1934 against Neustar, its Board of Directors, and Golden Gate, and is captioned Parshall v. Neustar, Inc., Case No. 1:17-cv-00060-LPS (D. Del.). More information at MarketWatch link above. 6. GoDaddy $GDDY Q4 2016 Results, LIVE Webcast (Replay)--Feb 15, 5:00pm ET | DomainMondo.com: "2016 Revenue Growth of 15% Driven by 7% Growth in Customers." 7. InternetAssociation.org, a trade group representing internet giants including Facebook and Google, is launching a new online political fundraising platform.--Internet Association Brings Political Fundraising Into The Digital Age With New Crowdsourcing Platform | InternetAssociation.org. 8. Fame Names, Domains & Trademarks--The Designer Formerly Known As…Intellectual Property Issues Arising From Personal Names As Fashion Brands | Ladas & Parry LLP | JDSupra.com--or how to lose your personal name. 9. The Problem with "The Seven Keys" | ICANN.org: "From time to time, articles are published about "the seven people who control the keys to the Internet.” These articles, while probably well-intentioned, are completely incorrect. Let’s be absolutely clear: there are no keys that cause the Internet to function (or not to function) ..." Read more at the link above. "... At the recent ITU World Telecommunications Standardisation Assembly (WTSA) held in Tunisia in November 2016 DOA dominated much of the discussion. It placed those countries that support the initiatives being pursued within the ITU (referred to above) in direct opposition to those who are currently fiercely opposed to that approach from both technical and political perspectives ... Although the subject of much discussion, both from a technical and political standpoint, there is clear evidence that in many cases there is a lack of understanding of what DOA really represents. Some people even speak of DOA as a replacement DNS, which it certainly is not ... The ISPCP bring this issue the attention of the ICANN Board with a request that the Board considers how best to work with its involved stakeholders and the technical community to raise awareness of DOA and ensure that the community has a true, factual understanding of the situation and its relationship to ICANN ..."
12. Internet Identifiers Attack Mitigation: Identifier System Attack Mitigation Methodology (pdf, 876 KB)--"this effort addresses Recommendation #12 of the Security, Stability & Resiliency (SSR) Review"--excerpt: "ICANN is proposing a new Identifier System Attack Mitigation Methodology to: • Identify, prioritize, and periodically refresh a list of top Identifier System attacks; • Develop guidance on actual high-impact attacks and emerging high-risk vulnerabilities; • Describe corresponding attack mitigation practices that are commonly considered useful; and • Encourage broader adoption of those practices via contracts, agreements, incentives, etc. This document represents the first component of this methodology ...."
13. The ICANN mafia has taken my site hostage for 2 days now | levels.io and ICANN has taken my site hostage | Hacker News | news.ycombinator.com. "Revenues for our Registry Services business are attributed to the country of domicile and the respective regions in which our registrars are located, however, this may differ from the regions where the registrars operate or where registrants are located. Revenue growth for each region may be impacted by registrars reincorporating, relocating, or from acquisitions or changes in affiliations of resellers. Revenue growth for each region may also be impacted by registrars domiciled in one region, registering domain names in another region. Although revenues continued to grow in the more mature markets of the U.S. and EMEA during 2016, China saw the highest growth rate due in part to the increased volume of new registrations during the second half of 2015 and the first quarter of 2016." Note 4. Deposits to Acquire Intangible Assets: "As of December 31, 2016 , the Company has paid $ 145.0 million for the future assignment to the Company of contractual rights to the . web gTLD, pending resolution of objections by other applicants, regulatory review, and approval from ICANN. Upon assignment of the contractual rights, the Company will record the total investment as an indefinite-lived intangible asset." On January 18, 2017, the Company received a Civil Investigative Demand (“CID”) from the Antitrust Division of the United States Department of Justice requesting certain material related to the Company becoming the registry operator for the .web gTLD. We are in the process of responding to the CID. It is not possible at this time to estimate a range of potential financial and non-financial outcomes in connection with this matter. Report of Public Comments | Identifier Technology Health Indicators: Definition | ICANN.org: "... several expressed concerns over the proposed use of Latin-like medical-based terminology [Datamalgia, Abusitis, Magnitudalgia, Perfluoism, Datafallaxopathy] to identify Internet health conditions. Since this feedback was so clear, ICANN is dropping the Latin terminology as the project goes forward." For background read: News Review: ICANN Busy Proving IANA Transition Was A Terrible Mistake: "8. ICANN is this a joke OR is ICANN the joke? ..." (01 Jan 2017). News Review: Who Needs a Domain Name and Website Anymore? Facebook just changed its mission, because the old one was broken | TheVerge.com: "in a remarkable letter published today, CEO Mark Zuckerberg acknowledged the severe shortcomings and blind spots that his company’s mission created ..."
Scott Galloway: Snap IPO $SNAP, This Is the Top of the Market (video). • You can take your "sh*t sandwich" job offer and ...: after President Donald J. Trump threw Lt. Gen. (ret.) Michael Flynn 'under the bus' on Monday, retired Vice Admiral Robert Harward turned down Trump's offer to replace Flynn as National Security Advisor, reportedly saying the job offer was a "sh*t sandwich." Amazon reported sales of about $6.4B for 2016 retail subscription services, including Amazon Prime, up 43% YoY. • New FCC chair closely guards his strategy to restructure net neutrality | Reuters.com. U.S. Representative Marsha Blackburn (R-TN) has said Congress will let the FCC "make the first move" on net neutrality.